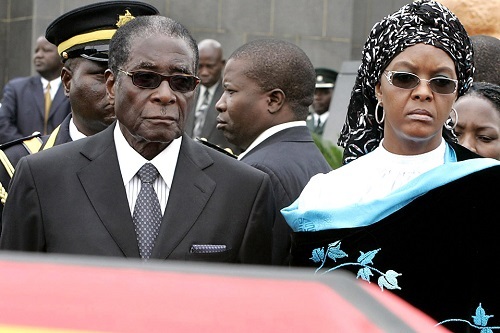 Dear Grace Mugabe – This is for you. The voices are calling you to step down from your position as a de facto Zimbabwean executive president. You have appointed yourself to preside over the governance of the once beautiful country of Zimbabwe and you have since overstayed your self-appointment and self anointment. During your three year term in office you have proved just to be a qualified money-guzzling machine. You have been keeping our country in your handbag. In October 2017 you reshuffled your cabinet and replaced the old cabinet with the worst looters who have pending corruption court cases and you don’t even care. Your actions and deeds are not inspired and are testimony of your violent and corrupt conduct which is the path you have chosen to sink our beloved country in your ego and tyrannical ambitions. SHAME! We need new occupants in the State House. Citizens need clean water, electricity, money, houses, fair elections and food. Tears of hungry CITIZENS are going to be the fuel burning hell. STOP disgracing the masses, Brave Voices will speak and will not stop but rather continue to speak against your ills and vices. The 9th publication of the Zimbabwe We Want Poetry Campaign is a composition of solidarity, voices from the United States, India, Bangladesh, Nigeria, Ghana and South Africa. Zimbabwean Voices make a large number of those published. A great thank you Solidarity Voices. We would like to thank again the International Human Rights Arts Festival in New York for including Brave Voices in the Festival line-up. Our sister publication partner Zimbabwe Sphere, we thank you as well. Kindly contact us at miombopublishing@gmail.com for more information. You can also send your poetry via the Zimabwe We Want Poetry Campaign facebook platforms: 100 Thousand poets for Peace – Zimbabwe and MiomboPublishing. Brave Voices; Let your pen and your voice defend the suffering Zimbabwean masses. all you who feed fat on bloody wars. and bring harvest to men. shut, abused, declined or ruined! Is this the leadership of the so-called revolutionaries? and continue to vote blindly? It’s high time the nation must demand its vote’s worth! your rights being trampled upon. Any which way a change must come! than being part of this misery. And speak only when spoken to. And it’s unladylike to even think it. To know my place and stay there. Coffee, tea or water? Not what’s in my wallet? And multiple streams of flow. And filing the chains off my waist. Because I’m no longer shuffling. mountainous obstacle in my way. For daring to block my path. After 50 years from now. By the deep, dense woods. Or whispering with the wandering clouds. And busy with writing verse. But I will bear with the brunt of destiny. They will seek but find me nowhere. forgive them that sin against us. May our hearts be dressed in the colour of love and compassion. may we stand for justice, mercy and righteousness. To say no to the enslavement of man. who plot to take our lives. war with us, for us. sets out to harm us. The quest still moulds bitterness. Our shrines to enchant his wiles so deceitful. And Nehanda prophecy to have clinched woe. As the liberty secrets bitter tastes. To where we came from, victims of circumstances. Themselves from the more dirt in their lives. Again, and poverty like a whore in every bedroom. What do you say, Mugabe? Your people ask. Save yourself, Robert; save Zimbabwe. It is a war on a paper over the minority now! On wings of hunger against a denuded sky. Her children will wait another day to die. Shadow of a teak behemoth halfway to the sun. By the boys earlier, ere the sun’s noon ascent. Hazy steam is rising from a can on a lazy fire. Unburden your spirit it says, you’re in a poem. I was born along with country, listening to the afro beat of political music. Embezzlement of state funds is now the order of the day. When l first saw you, you were the breadbasket of Southern Africa creating employment opportunities to the people and region at large. My heart aches…l am having sleepless nights wondering if you will regain your beauty. I am crying for you my beloved ZIMBABWE.